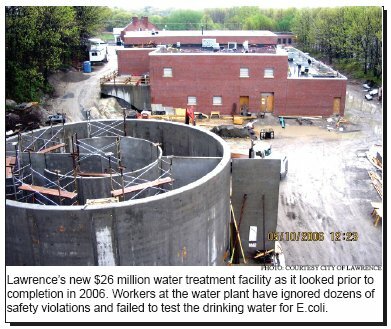 Documents obtained by The Valley Patriot last month revealed that operators at the City of Lawrence’s brand new $26 million water treatment facility failed to test the city’s drinking water for a bacteria called E.coli from July 2008 to February 2009. The Massachusetts Department of Environmental Protection (MassDEP) requires monthly testing for E.coli which can cause sickness if consumed. This is the second time in less than a year that the MassDEP fined Lawrence for failing to do mandatory testing. In October of last year the state fined Lawrence $5,000 for failing to test for chlorite in the drinking water and ordered the city to fix a host of mechanical, maintenance and procedural problems at the facility. In February 2009, MassDEP warned Lawrence officials that the list of violations at the water plant from that October fine had not been addressed. As the result of operators at the plant failing to address those issues, the state hit Lawrence with $47,750 in penalties. The 13 page Consent Order obtained by the Valley Patriot and signed by Lawrence Mayor Mike Sullivan lists a host of safety hazards at the plant that city officials have refused to resolve, such as: failing to test for Cryptosporidium, failing to follow proper safety procedures, corrosion in the chemical feed room, failing to comply with previous warnings and consent orders, failure to have adequate maintenance schedules, failing to notify DEP of testing and operational inspections, and failing to comply with the requirements of a February 2008 notice of non-compliance. Tennis Lilly who serves as the chairman of the city’s conservation commission said that he was outraged by the lack of competence at the water plant and added that, as a environmental activist and private citizen he demands accountability from the city. “Once again we have a DEP fine that was based on the lack of testing for an environmental hazard,” Sullivan said. “This time it was their failure to test for E. coli. Now that’s very serious. When I saw the minutes [written record] of the DEP meeting where Mr. Mark Griffen (the plant operator for the city) and Frank McCann (the DPW Director) admitted to every single item in the DEP fine … I was stunned,” he said in frustration. Lawrence City Attorney Charlie Boddy said that the issue of non-testing and the other safety violations found by MassDEP need to be addressed immediately, “especially given that it’s the second fine in less than a year.” Boddy explained that despite the presence of the private contracting firm Woodward and Curran operating the plant, it is the city’s responsibility to do testing and report those mandatory tests to the MassDEP. “We’re in a difficult situation because there are issues with regard to supervisory oversight at the water treatment plant,” Boddy said. In the mean time, the Lawrence City Council has refused to ratify a long-term contract with Woodward and Curran despite several attempts by the mayor to move the management of the water treatment facility from the city to the private firm. In October 2008, MassDEP fined the City of Lawrence $5,750 after finding that operators at the water treatment facility failed to test the drinking water for a chemical called chlorite. The (DEP) requires that the city test for the chemical each month under the Clean Water Act. No disciplinary action has ever been taken against any of the city employees responsible for failing to do the mandatory testing and to date, no employee has been held accountable for “continuing violations” at the plant. Under Lawrence’s City Charter, the water department falls under the responsibility of the Department of Public Works (DPW). Frank McCann is the DPW Director. Mayor Sullivan had to layoff eight workers from the water treatment plant last year but was forced to bring them back because of union contract issues. The workers were initially replaced by the private firm of Woodward and Curran whose workers are now performing the duties that city workers used to be tasked with. But after the city was ordered to bring them back to work, Sullivan said they returned to the facility but have no job duties. Asked who was directly responsible for making sure the testing was done on time and reported to the DEP, Sullivan said it was the plant supervisor and DPW Director, Frank McCann. “The responsibility falls directly on the plant operator, Mr. Griffen and his supervisor Frank McCann,” the Mayor said angrily. In October 2007 the state fined the city $39,500 for inadequate security procedures, noncompliance with the plant’s disinfecting process, violating sampling protocols and inadequate turbidity requirements. In February 2008 the city and MassDEP entered into a consent decree whereby MassDEP would reduce the $39,500 fine to $19,500. In return, the city agreed to beef up security at the plant, provide an updated operations plan and make sure all chlorine dioxide systems were working properly. To date, most of those issues have not been resolved. The DEP originally fined the city $100,000 for failure to test for E. coli but reduced the fine to $47,750. According to the MassDEP Order of Non-Compliance, the city was only ordered to pay $25,000 of the fine. MassDEP waived $22,750 on the condition that the plant be brought up to compliance and city officials correct all present and previous violations, something Mayor Sullivan says is going to be very difficult to do unless the council passes a contract for Woodward and Curran. “I’m not holding my breath that the city council is just going to wake up tomorrow and say, ‘ok, let’s start doing our job now, let’s get moving on this water issue.’ I just don’t see that happening so, in order to fix the situation I have come up with a creative way to fix this situation. Mayor Sullivan said he expects that the city workers in charge of rectifying safety hazards will continue to ignore the latest fines by the MassDEP. 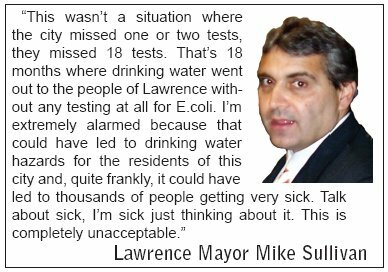 Sullivan said he is hiring former Lawrence resident Geoff Fulgione to oversee the city’s deficiencies in the management of the water treatment facility. First: To hold people accountable within the management of the water treatment plant. Second: To work together with EPA and with DEP to satisfy any requests they might have going forward.